Witnesses for the plaintiff were clear about their positions during a day of testimony at the Alfred A. Arraj District Courthouse in Denver on Tuesday. 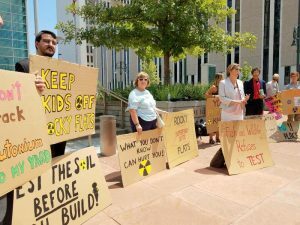 Many in the courtroom were around during the time that Rocky Flats Nuclear Weapons Plant was operating, during the subsequent massive protests, and a 1989 FBI raid at the plant that eventually led to its shutting down. District Judge Philip Brimmer was supplied with information that plaintiffs seeking an injunction wanted him and the public to know: That there is no such thing as a safe level of exposure to weapons-grade plutonium. 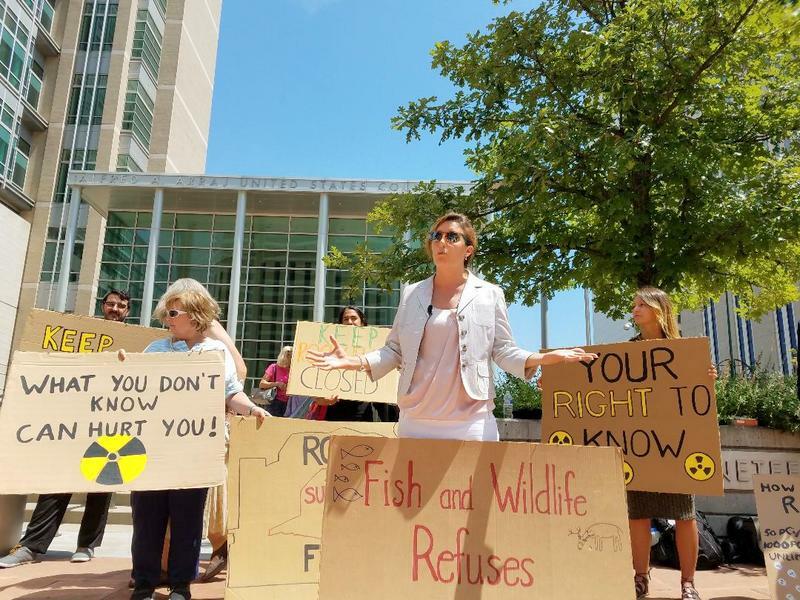 The plutonium once used to manufacture triggers used in nuclear weapons at Rocky Flats still contaminates the site near where the US Fish and Wildlife Service (USFWS) wants to open the area to the public for recreation according to testimony. Currently the surrounding area is a wildlife refuge handed over to the USFWS by Congress to manage in 2001 through the Rocky Flats National Wildlife Refuge Act of 2001. The USFWS originally had plans to open trails to the public on September 15 for hiking, biking, and horseback riding, but those seeking to block the move want to protect the public from possible exposure to residual radiation. 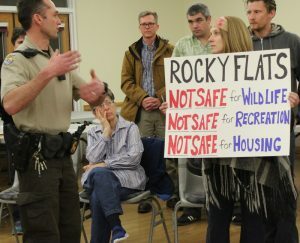 Brimmer acknowledged the high public interest in the subject, “Usually when I have hearings, no one’s here.” Members of several local organizations attended the all day hearing, including the Rocky Mountain Peace and Justice Center, Candelas Glows, Rocky Flats Downwinders, Rocky Flats Right to Know, Rocky Flats Neighborhood Association, and Environmental Information Network. David Lucas, project leader at the USFWS and manager of the Refuge, has maintained that the area is safe, and that he currently manages tours of the area. But three scientists rendered the point moot by providing evidence that the area will never be safe – never meaning at least for 24,000 years, the half-life of the plutonium at Rocky Flats, and the beginning point at which the contamination is expected to begin a decaying process. One of those scientists, Michael Ketterer referenced the soil samples he gathered from 2000-2003 east of Indiana Street in Arvada that contained plutonium with a signature originating from Rocky Flats. Ketterer testified that the isotope identification from Rocky Flats plutonium is of a density multiple times that of the ubiquitous plutonium scattered from nuclear testing of the 1950s and 1960s. 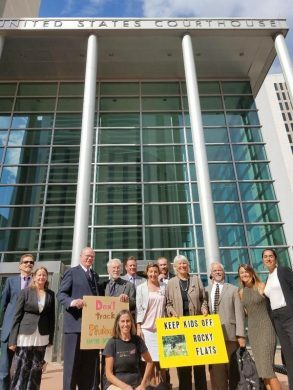 Attorney for the plaintiffs Randy Weiner challenged Lucas to describe any testing of newly proposed trails that had not been part of prior sampling, but Lucas responded that he didn’t know what the Environmental Protection Agency had done, because he hasn’t communicated with the agency. 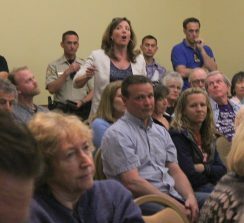 Lucas’ representative, Department of Justice attorney Jessica Held in her opening statement described a scenario of the USFWS having consulted the public of its plans for development of the area, but failed to mention that what the Service called “sharing sessions were actually met with vocal public objection to USFWS’ proposals. Former FBI agent Jon Lipsky who headed the 1989 raid of the plant that led to convictions for environmental crimes testified that he attended 2 of the 4 “sharing sessions” but with armed guards present at the meetings, didn’t feel free to fully express his findings. 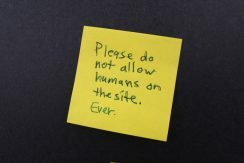 Lipsky has since joined the Rocky Mountain Peace and Justice Center in the work to keep the area closed to the public. Lipsky testified that a white barrel found outside of the closed off perimeter was what he recognized as a “classic” barrel used to contain radioactive plutonium for transport off of the premises to a test site in Nevada after the plant’s closing. The corrosion and eventual leakage of the barrel is concerning to him and to John Barton who worked at Rocky Flats for 20 years. Barton has suffered from cancer since his employment there. In his early years, Barton said that he thought the 1989 raid was a waste of time, but has since changed his position. As part of the clean-up effort, Barton oversaw the shipping of the classic white barrels as well as “glove boxes” that contained “classified parts of a weapon” saturated with plutonium. He testified that he saw multiple plutonium-ladened boxes strewn near the fenced-off area of the site. The barrel, glove boxes, and the implosion of the original buildings are reasons enough to keep people far away contend those who work to keep people away from the area. Harvey Nichols, a professor emeritus at the University of Colorado, Boulder, researched ecology and the environment and took snowfall samples in the 1970s at the Refuge. His figures showed “radioactive particles in great numbers.” A British citizen, his concern was so great, he said he became a US citizen just to be able to petition his legislators about his findings. Nichols acknowledged that he got no response from his representatives. Inhalation of plutonium particles is considered the highest risk to health acknowledged Dr. Timothy Mousseau who testified from New York by telephone. Mousseau, a biologist who studies the effects of environmental radiation has studied the radiation from the Chernobyl, Ukraine and Fukushima, Japan nuclear disasters and criticized that the studies conducted by the Environmental Protection Agency studied soil, but not transport. The transport of particles is rarely discussed, but important to consider according the Mousseau who cited the case of Chernobyl where a fire dispersed particles to outside the most contaminated area. Plaintiffs in this case refer to the 2013 flood in the Front Range area where it is believed that further contamination has occurred. Those health effects include cancer, especially bone and liver cancer. An example presented by one nearby resident to Rocky Flats was Elizabeth Panzer whose son has been diagnosed with cardiac angiosarcoma. Panzer testified that her son’s particular form of cancer is rare, and that another neighbor contacted her to say that a member of her family also was diagnosed with the same cancer. The risk to children has led the Rocky Mountain Peace and Justice Center to approach local school districts to persuade school officials to keep students away from the area. Seven districts agree and have banned field trips to the area. Editor note: Type Rocky Flats into the search engine of The Nation Report to see extensive coverage of these school board decisions.